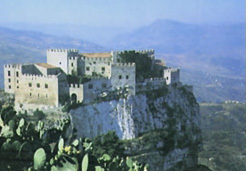 Caccamo Castle - See Palermo and Western Sicily. Caccamo is about 14 kilometers south of Termini Imerese and Himera, up a winding mountain road. The town has a certain charm, and vestiges of the Middle Ages. The mountain upon which Caccamo Castle sits has been fortified, in one way or another, since ancient times. The town's greatest attraction is the large 12th-century fortress, boasting a spectacular location overlooking the scenic San Leonardo River Valley far below. It is usually open to the public mornings a few days a week. Epitomizing medieval Sicily, was a feudal castle built by a Norman enfeoffed knight, Matthew Bonellus, during the twelfth century, probably upon an older Saracen fortress, and modified considerably in the successive centuries under the Chiaramontes and others. Bonellus himself was one of the major plotters of the so-called "Baron's Revolt" of 1160 --though (not without a certain irony) the street from which one enters the arched principal entrance of Palermo's cathedral is named for him. With its splendid towers and battlements, the gray stone structure retains most of its medieval appearance. It has recently undergone an extensive restoration which was at least reasonably faithful to the original style. The castle is set upon a steep cliff, and in that respect and others is similar to Mussomelli Castle and others around Sicily, though obviously much larger. Caccamo Castle is open weekdays and Saturdays from 9 to 1 and then from 3 until 8. 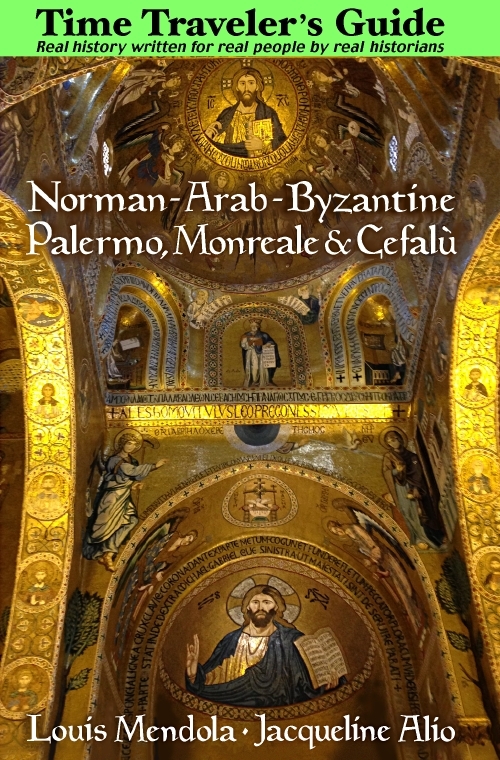 While you're in Caccamo, visit the Church of Saint George near the castle. Though largely reconstructed during the sixteenth century, it has some interesting relics of its medieval past (it was built in 1090), such as an old baptismal font. It also has an interesting collection of ecclesiastical vestments. The Annunciation (Annunziata) Church is also medieval, though extensively modified. If you're driving, a brief visit to Caccamo can easily be scheduled as a stop en route from Palermo to Cefalù. If your taste runs to the medieval, you won't be disappointed. An arched bridge dating from the Middle Ages spans the San Leonardo River, but since 1994 it has been submerged by a man-made lake formed by a dam.